Take a bowl add corn flour,salt,red chilli powder, salt to make a soft batter. Dip the paneer & deep fry. 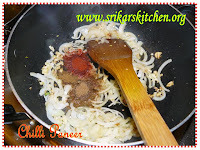 Melt butter in a kadai, add ginger,garlic,g.chilles ,onion & saute few mins. Add all powders & all capsicums to saute few mins. Add all sauces & allow to cook. 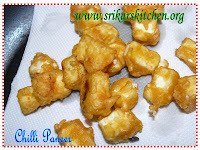 Add fried paneer & mix well. 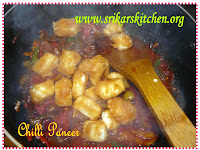 chili paneer looooks yuuuummmmy. name itself so tempting. I also made this one. one of my fav dishes... looks colorful. 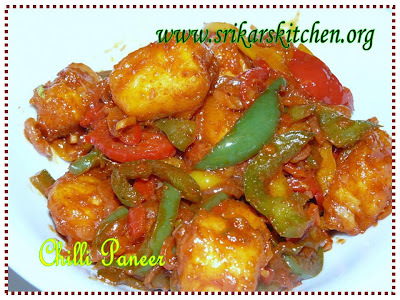 Yummy Chilli paneer, pics makes me hunger..delicious paneer..
Yummmmmmmmmmmmmmmmmmmmmmmmmmmmmmmmmmmmmmmmmmmmmmmmmmmmmmmmmmmmmmmmmmmmmmmmmmmmmmmmmmmmmmmmmy. Do i need to say more? so delish and mouthwatering. this will be my sundays spl this wk. Sripriya can i come over......u r making a whole lot of spicy food.......i couldnt resist. 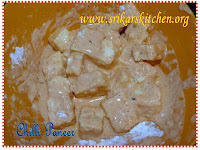 WOw one of the best paneer dish i have seen lately. bought all ingredients will make itsoon. first time in ur blog.so nice.